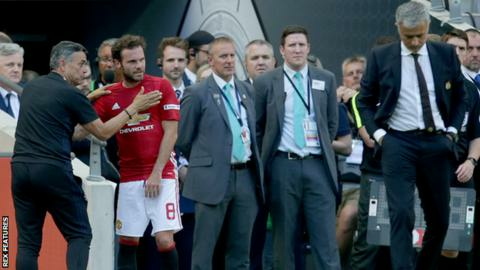 Substitute Juan Mata was replaced in Manchester United's Community Shield win "because he was the smallest player", boss Jose Mourinho said. Mata, sold by Mourinho to United when at Chelsea, looked unhappy to be taken off 30 minutes after coming on in the 2-1 win over Leicester City at Wembley. "I needed to take off the smallest player because we were expecting a lot of long balls," Mourinho said. But BBC pundit Danny Murphy said the decision was "embarrassing" for Mata. "You don't do that unless you are trying to send a message," ex-England midfielder Murphy said. "They have a lot of history at Chelsea and he has embarrassed him in front of his supporters and his family. "He is basically saying to him you are not important and he has done it publicly. I can't see him still being at the club at the end of August." Midfielder Mata, who is 5ft 7in tall, was sent on in the 63rd minute in place of goalscorer Jesse Lingard, with the score 1-1. He was replaced 10 minutes after Zlatan Ibrahimovic's 83rd-minute winner by 5ft 10in new signing Henrikh Mkhitaryan. Mourinho put his arm around Mata when the Spaniard came off three minutes before the final whistle but the former Valencia player looked unimpressed. The ex-Chelsea boss played down the incident, explaining he needed to replace 28-year-old Mata to "stop the game". "The rules allow six changes, I had made five and I wanted to stop the game," added the Portuguese, appointed in May, after landing his first piece of silverware as United boss. "I think he played very well. He gave me exactly what I needed," added Mourinho, who sold Mata to United for £37.1m in January 2014 before leading Chelsea to the Premier League title the following season. "We want to win. Everyone is happy in the end." How does Pogba fit into Mourinho's plan? Read more on Paul Pogba: Is France midfielder Man Utd's most expensive mistake?